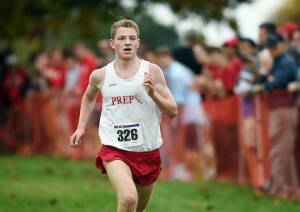 Andrew Thompson of Fairfield Prep and the best runners in Connecticut will take part in the CIAC Divisional Championships this weekend. Catherine Avalone – New Haven Register. The first championships of the 2016-17 high school season will take place on Saturday as the best distance runners in the state converge on Wickham Park on Manchester for the Divisional Cross Country Championships. Twelve team titles (six girls, six boys) will be decided along with an individual champion in the six raises. The entry lists have been posted so the competing teams and athletes are identified. There will be a lot happening with 12 races taking place, so to help get ready here are a few pieces of notes and information as the CIAC championship season gets underway. You can also check out this edition of the CIACcast for a breakdown of the season and the championships. Familiar foes square off again: FCIAC rivals Danbury and Staples have been among the favorites in the Class LL meet throughout the season; as both have been near the top of the Connecticut Coaches Cross Country Poll. Danbury had been in the driver’s seat much of the year, but Staples sent a message with an impressive win at the FCIAC Championships. How will the battle shake out at the CIAC meet, or will another team jump up and get into the mix? Coming out party: On the girls side, Pomperaug has emerged as the top team in the coaches poll and looks to be a strong favorite in Class L to earn the program’s first title since 2010, and its fourth championship overall. The other divisions seem to be a mix of perennial favorites continuing success such as Tolland in Class M and Immaculate in Class S, and some genuine toss-ups in the other classes. Filling the void: Last year’s Divisional Championships, particularly on the boys side, saw a talented group of seniors leave their mark with strong performances. Twenty-one of the 30 top-5 finishers on the boys side were seniors, and 14 of 30 on the girls side. In addition nine of the 12 race winners were seniors. This leaves great opportunity for some new faces to step up and leave their mark on the meet. Who will those folks be? Surprise, surprise: While there may be some new faces claiming individual titles, consistent champions has been a theme of the team competitions in recent years. Four of the six boys team champions from 2015 repeated as winners from 2014, and that was true of three champions on the girls side. The Tolland girls team enters the weekend having won the last five championships in Class M, while the Glastonbury girls have won three straight crowns in Class LL. Though there were several repeat champions on the boys side last year, there is no team with a streak of more than two-consecutive divisional titles. If you are really looking for parity in the boys meets, Class M has boasted a different team champion each of the past six seasons. The longest stretch without a repeat winner in the girls meets are Class L and SS which have had a different winner each of the past three seasons. Beating the clock: The fastest times on the course in the divisional races last year were produced by a pair of talented seniors. Staples Hannah DeBalsi ran 18:14 for the fastest time in the girls meet, and Eric VanderEls from Brien McMahon won a tight Class LL race with a time of 15:52. Right now the weather looks like it could be ideal for some fast times on Saturday, and a few runners this year have approached those marks. Katherine Deloreto from Tolland and Andrew Thompson from Fairfield Prep have the best 5K times in Connecticut this season according to MileSplit.com. Will that pair — or anyone else — produce a run that tops the best from last year and really grabs the attention of the running community as the championship season continues? Those are just a few of the many, many interesting stories that will emerge with an exciting day of competition on Saturday. Let’s get excited for another big year of CIAC Championships.